See how Sustainability at Bellevue College is helping to make our campus a more environmentally-focused community! Bellevue College celebrated its first Earth Week in the spring of 2000. Since then, Sustainability at Bellevue College has expanded its efforts with new solar panels, electric car charging stations, campus wide composting, a student and faculty community garden, and launching the Sustainability Concentration program and the Office of Sustainability. 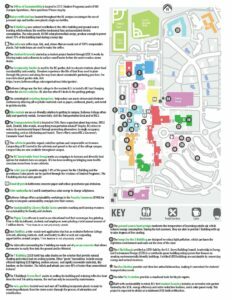 Many of the projects on the map were supported by the Student Environmental and Sustainability Fund (SESF) which supports projects by students, faculty, staff, and administrators that provide the campus with sustainable resources for student use and education while enhancing Bellevue College’s efforts to create a campus that is socially, environmentally and economically responsible. Have an idea? Apply for a SESF grant. Or follow our Facebook or Instagram page! 1. The Office of Sustainability is located in C212 (Student Programs) and in K100 (Campus Operations and Security). If you have any questions please stop by. 2. Water-refill stations located throughout the BC campus encourages the use of personal cups and bottles over plastic single-use water bottles. 3. The R-Building uses natural ventilation in the office building and ground source heating and cooling, which reduces the need for mechanical fans and associated electric consumption. The solar panels, 83 KW solar photovoltaic arrays, produce enough to power about 70% of the building load during a sunny day. ◊ The cafes use coffee cups, lids, and straws that are made out of 100% compostable plastic. Fair trade beans are used to make the coffee. 4. The student bioswale started as a student project funded through the SESF. It works by filtering toxins and sediments in surface runoff water before the water reaches storm drains. 5. The community garden is used by the BC garden club to educate students about food sustainability and security. Members experience the life of food from seed to plate through this process and along the way learn about sustainable gardening practices. Click here for more information about garden club. 6. Bellevue College was the first college in the western US to install a DC Fast Charging Station for electric vehicles. BC also has other EV docks in the parking garage. 7. The commingled recycling dumpsters help reduce our waste stream and eliminate confusion by allowing all recyclable materials such as paper, cardboard, plastic, and metal to go into one bin. 8. Bike rentals are an eco-friendly solution for getting to campus. Bellevue College offers daily and quarterly rentals. For more info, visit the transportation desk (C106) and/or the PALS Center (C105). 9. The transportation desk is located in C106. Have a questions about bus routes, ORCA cards, Zimride, bike rentals, or anything transportation related? Stop by! BC strives to reduce its environmental impact through promoting alternatives to single occupancy commuting, such as ridesharing and transit. These efforts earned BC a Governor’s Commute Smart Award. 10. The BC Sustainable Food Group works on campaigns to increase and diversify food options fro students here on campus. SFG has been working on bringing more health conscious menu items to our cafeteria. 11. The solar panels provide roughly 7-8% of the power for the C Building and the greenhouse (solar panels can be spotted through the windows of Student Programs). The R Building also has solar panels! ◊ Hand Dryers in bathrooms conserve paper and reduce greenhouse gas emissions. 13. Bellevue College offers sustainability workshops in the Faculty Commons (D104) for faculty to integrate sustainability concepts into their courses. 14. The Sustainability Library Media Center provides teaching and learning resources on sustainability for faculty and students. 15. The Paper Cut software is used as an educational tool that encourages less printing. Prior to this installment, students and employees were printing a total annual amount of 7 million sheets. * This feature is not physically visible. 16. Join Zimride, a ride-match web application that has an exclusive Bellevue College network, allowing students, faculty, and staff to offer or seek out carpooling opportunities around campus. * This feature is not physically visible. 17. The sidewalks surrounding the T Building are made out of porous concrete that allows stormwater to easily flow into the ground and be filtrated. 18. The T Building (LEED Gold) has solar shades on the exterior that provide natural shading and reduce load on cooling systems. Other “green” innovations include energy efficient lighting (LED lighting, motion sensors) and building with rapidly renewable material, like bamboo, on the interior. The toilets and urinals save over 40% of water than conventional fixtures! 19. The T Building’s green roof assists in cooling the building and reducing reflective heat from the roof. For safety reasons, the roof can only be accessed by maintenance. 20. The rain gardens located west and east of the T Building incorporate plants to assist in removing pollutants from the storm water through the process of adsorption and volatilization. 21. The ground source heat pumps moderate the temperature of incoming outside air, which reduces energy consumption. During hot summers, they are able to provide T Building with up to nine degrees of free cooling. 22. The sidewalk lamps by the S Building are designed to reduce light pollution, which can harm the nighttime environment and wash out the view of the stars. 23. The S Building is certified as LEED Gold by the U.S Green Building Council. Leadership in Energy and Environmental Design (LEED) is a worldwide green building rating system that focuses on creating environmentally friendly buildings. Certified LEED buildings are sustainable by conserving energy and natural resources. ◊ The Bus Shelter provides real-time bus arrival information, making it convenient for student’s transportation needs. 24. The bike Fix-It Station provides a stand and tools for bicycle repairs. 25. Built with sustainability in mind, BC’s first student housing includes an extensive rain garden funded by the SESF, energy efficiency and water reduction features, and is solar panel ready. This project is expected to obtain at a minimum LEED Gold certification.